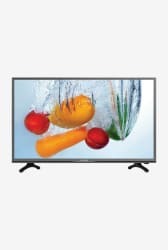 Slim and stylish in design, this Lloyd L39FN2 98 cm (39 inches) Full HD LED TV gives a high quality, crystal clear viewing experience. Enjoy your favorite movies or television shows with your family on this 39-inch wide-screen TV with built-in speakers. Furthermore, the 2 HDMI ports allows for smooth HD viewing through various sources as well.